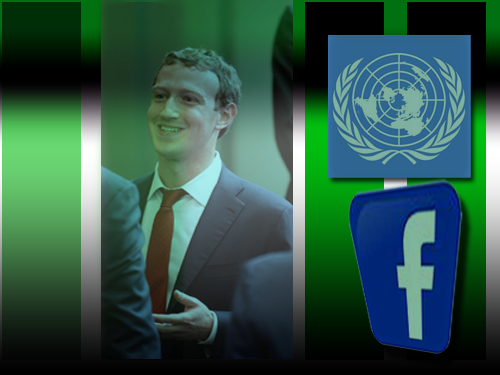 Agenda 2030 Update- Facebook's Zuckerberg Wants To Save Refugees With Divine Internet! Facebook CEO Mark Zuckerberg is now jumping in on the recent avalanche of pro-global government "Agenda 2030" propaganda and everything he has to say is perfectly in line with the opening mission statement of the recent Agenda 2030 new world order declaration. This Agenda is a plan of action for people, planet and prosperity. It also seeks to strengthen universal peace in larger freedom. We recognise that eradicating poverty in all its forms and dimensions, including extreme poverty, is the greatest global challenge and an indispensable requirement for sustainable development. All countries and all stakeholders, acting in collaborative partnership, will implement this plan. We are resolved to free the human race from the tyranny of poverty and want and to heal and secure our planet. We are determined to take the bold and transformative steps which are urgently needed to shift the world onto a sustainable and resilient path. As we embark on this collective journey, we pledge that no one will be left behind. Clearly we can see that the United Nations is taking on the responsibility of "freeing" humanity from the "tyranny" of poverty. And it is up to countries and all "stakeholders" (like Facebook) acting in collaboration to implement this plan. To push this king size propaganda the internet is made to sound like divinity, essential for life and freedom. When did the internet become such a divine cornerstone of morality, freedom and human dignity?? Notice no mention of stopping illegal wars of aggression, arresting and convicting everyone involved in global spraying programs that are contaminating and destroying the planet and altering the climate, both which greatly contribute to disease, death, poverty and the need for healing of the human race. Anyone paying attention to news headlines over the past week and seeing similar new world order speeches spun out by the Pope, should be asking themselves by now, is this new level of globalist propaganda for real? And, is anyone buying into this global peace, sustainability and prosperity rhetoric? Connecting people to the internet on one side of the planet while murdering others on another part of the planet. That's how crazy this is. But more importantly notice how Zuckerberg is being positioned as someone who has an obligation to step in and provide this service to the world. The connectivity ambitions are at the center of Mr. Zuckerberg’s advocacy effort, Internet.org, whose goal is to offer Internet access to about four billion people in the world who cannot afford smartphones or do not live near fiber-optic cable lines or cell towers. This is rule by plutocracy and this is very much a part of the blueprint for the new world order where the wealthy elite run the world along with other government rulers. Who appointed Facebook and Zuckerberg the Czar of the global internet service? Isn't this a little too much power for one young man? They're building up the recent Agenda 2030 campaign to get as many people as possible thinking about what life would be like to have the U.N. control what everyone does. In this new global order the implementation of this wonderful life will be in the hands of supposed righteous transnational corporations like Facebook and other tech companies who are apparently responsible for the state of humanity. And governments throughout the world will also be responsible for righteously and "responsibly" making sure everyone obeys. Like this we (the rest of the useless eating humanity) can all enjoy our new "freedom" in a wonderful "sustainable" world where everyone is "accountable" and "responsible" for agreeing, tolerating and obeying. Anyone who doesn't agree, tolerate and obey will be in violation of the global order. Violators will then be punished according to the global order. Get the picture? In this recent episode of the same agenda 2030 promotion campaign, Facebook's Mark Zuckerberg is coming out of nowhere and taking advantage of the refugee propaganda story to cash in some points for his company. Keep in mind, the ISIS psyop and the well known western cabal's takeover plans in Syria have run into a political brick wall with Russia now coalescing forces to uniformly "wipe out" ISIS and the U.S.-Israeli-Turkey-and-company ISIS support team can't be too happy about that. Because of this unexpected political failure in Syria it is believed that the U.S. is clinging on to the "refugee" excuse as its only hope to use it as leverage to justify their otherwise unwanted presence in Syria. So it shouldn't surprise anyone that all of a sudden here comes Zuckerberg to save the refugees with his internet thus hoping to further establish a U.S. roll in the regions where the refugees are located. Suddenly we're told by Zuckerberg that the internet is a "force for peace" and an "enabler of human rights" and this is why he's doing this. I don't think anyone thinks of Facebook and human rights in the same context. Some people might suggest that Zuckerberg is being sincere. My response is simple. Focus on what Zuckerberg is not saying. What he is not saying is much more important than what he is saying. This is one of the effective proven ways to derail propaganda which is what Zuckerberg is putting out. Zuckerberg is saying nothing about the U.N.'s recent call for Internet censorship agenda and Net Neutrality. And you won't hear Zuckerberg talk about the "rash of legal troubles" his company has had throughout Europe over privacy concerns. Or the fact that Facebook is not about giving people a voice on the internet but about collecting your real data and tracking your social network. Remember you cannot use a fake alias with a Facebook account, it acts as a real identity tracking system not an innocent portal of connectivity and "freedom". It may interest readers also that Zuckerberg was making this speech at a meeting with many prominent leaders and U.N. officials all involved in the new Agenda 2030 new world order plans. The control system is now feeding the general public a steady diet of agendas, upcoming regulations, strong (U.N.) suggestions and they are painting all these global future scenarios for you to mentally digest first. We're seeing a lot of talk about "global" this and that and I believe it's a type of predictive programming. Can you sense the new political global meme being deliberately permeated through the collective consciousness by the corporate mass media? Don't forget that's CIA's mainstream media, and I assure readers this is all planned. Welcome to the world of mass mind control. Anyone aware of these events is enjoying a front row seat to mass mind manipulation. Without this mass mind manipulation to condition everyone for the new world order, they know they'll never get it. For more examples of this mass mind conditioning you may be aware of recent TV ad campaigns for the technology and communication companies, some which are promoting cell phone service for "North America" (T-Mobile) and AT&T has a hypnotic man-behind-the-curtain (Wizard of Oz) subliminal commercial with a lot of suggestions about how the future is coming and things you can't imagine are coming your way. Is this coincidental? You decide. The question we should be asking is why are they doing this now? And why are they moving so fast? Fast moving agendas seem to be the trademark of the current administration. I was writing about this upcoming end-of-2015 push for the new world order and how this administration was determined to try to get this done and it's all here. I believe they're doing this now and they are moving so fast because they are all running out of time as more and more people wake up to the new world order plans. People are waking up all over the world to the new world order plans. This sounds like great news to many of us but it is bad news to them. Let's continue to stay on top of their moves and developments and hope that things continue to turn for the better of humanity which can thrive entirely independent of any government or draconian global rules. This is all tyranny at a global scale. You want to thrive like all the mumbo jumbo in that Agenda 2030 declaration? Then learn the essence of freedom and personal health. Free your mind first from mainstream media and government propaganda, then free yourself and others around you by learning to work together to solve problems. Resist government propaganda attempts to divide the people with race, culture, religion, gender, and politics. We (humanity) have all the tools to thrive while we are on earth and throughout human history humanity has never needed a global government to guide them in order to thrive. Say no to all the global government propaganda and help others to see this agenda for what it is. Then hopefully we will all see the end of this mass psychosis and the oppressive mental effect it has on us all. In my mind the global government doesn't exist and never will. What we are doing now is manifesting this reality within our own existence. The vision comes first. Can you see the solution?